You often feel as though you’re working all alone on an island with no support. You occasionally get stuck, and wish you had access to something or someone who could help you get unstuck. You struggle to build a large, loyal following. You see cool writing tools that you’d like to use to help improve your work, but the investment keeps you from taking advantage of them. If that sounds like you… well then, you’re going to LOVE this! Now through December 9, you can enter WritetoDone’s Ultimate Writer’s Advantage Bundle Giveaway and CASH IN BIG! You could win over $1,412 in prizes that we’ve hand-picked for writers like you. This package will help improve your writing, get you unstuck, provide you with premium one-on-one support, and even help you get (and keep) more visitors to your site! 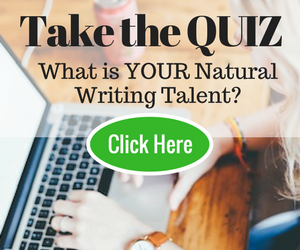 The incredible prize package we’ve created for you is jam-packed with all the tools you need to take your writing to the next level. You may already know Grammarly as the world’s best online grammar and writing checker. It’s like having a writing expert in your back pocket 24/7! Grammarly checks everything you write (as you write) for writing errors, and offer suggestions to make your writing stronger. It’s really incredible. If you’ve used the free basic version of Grammarly, you know what a valuable service it is. But the premium version does so much more! And it does a TON more to help you become a better writer. It’s really a fantastic tool - which is why Write to Done is a satisfied paying Grammarly Premium member. It integrates with Windows, Word, and many native desktop apps. You can check out definitions and synonyms with a simple double-click, you can add words to your personal dictionary, and see explanations of grammar rules so you can learn to be a better writer as you work. They can even send you performance stats via email! Never again will you wonder if you used a word incorrectly or worry that you’ve misused punctuation. This powerful service will alert you to any writing error you can imagine. It even gets genre specific AND offers a plagiarism check feature. 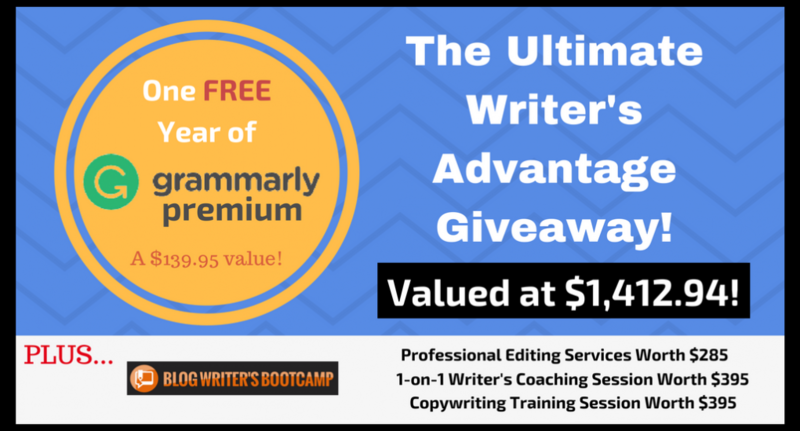 Grammarly Premium normally costs $139.95 for a year membership (in our opinion, it’s worth MUCH more), but the winner of this bundle will get a full year for FREE! The winner of this prize package will also receive FREE professional editing done by the Write to Done team. We’ll edit the piece of your choosing (up to 2,000 words) to get it in pristine shape! The Write to Done team has decades of cumulative writing and editing experience, so in the end you’ll not only get a polished piece, but also a TON of invaluable feedback including ALL of our edits and comments about the piece. We don’t usually offer this service to the general public, but we’re making an exception for the winner of The Ultimate Writer’s Advantage Bundle! Write to Done’s Editor-in-Chief Mary Jaksch will devote up to 60 minutes on Skype to discuss anything about writing with you. You can ask questions, edit a piece together, get advice on your author website or blog… literally ANYTHING that will help you move forward with your writing career. Mary normally only does individual coaching for premium clients, and when she does, the cost begins at $395 per hour. But the winner of this bundle gets it completely free! Write to Done’s Associate Editor, Gary Korisko, has professionally written copy that converts for many of the biggest names online like Jeff Bullas, Jon Morrow, Jeff Goins, and Danny Iny… just to name a few. Gary will get on a 60-minute Skype call with you to review your copy, answer your questions, and coach you on creating copy that not only reads well… but gets results! Regardless of what type of writing you do, you need to have an online place for your audience to congregate and interact with you. And online writing (that gets results) is a different animal than other styles of writing. You need to know how to grab and keep the attention of your online visitors so that you can secure them as followers and fans in the long-term. Blog Writer’s Bootcamp is Mary’s flagship course that teaches you the most effective ways to write for the web and attract a large, loyal audience. Whew! All together, the value of the package is $1,412.94! Quite the goody bag for any writer, wouldn’t you say? The winner of this bundle gets it all! You can enter the contest by clicking her﻿﻿e or by using the form below, but before you do, I want to tell you how you can get multiple entries and boost your chances of winning! How to Get More Entries! After you enter, we’re going to send you a special lucky URL that’s unique to you. Send that special URL to everyone you know. For EACH person who enters, we’ll give you THREE additional entries. That could add up! Are you a member of a writers group? A mastermind? Maybe you even have a mailing list full of writers! Each of them could be worth THREE more entries for you, so e﻿n﻿ter the drawing﻿ now﻿﻿﻿﻿﻿﻿﻿﻿ and spread the word! But remember, this contest ends at 11:45pm Eastern time on Friday December 9, so there’s no time to waste. Enter now and remember to share your lucky URL with everyone you know. It’s the best way to increase your chances of winning The Ultimate Writer’s Advantage Bundle! The one-year membership of Grammarly Premium was kindly sponsored by Grammarly. Where should children be positioned in a married relationship? Thanks for the insight and encourage you provide for writers. I peroidically receive your emails. Your content inspire me. Do you do contract editing and, at what rate? Glad to read your wonderful intimational post!! These gifts are really sounds amazing for productivity mainly grammarly. This really a good opportunity to win these prizes with our skill. Eventually, thanks for sharing your information with us.